Already here, leaves are beginning to turn color. In the vineyards, harvesting has been underway for some time. And soon enough, others of us will have restless sleep with nightmares of snow shovels and blowers. But south of the equator, thoughts are different. Those in the vineyard will have their sleep interrupted by thoughts of all the work ahead. Budburst (September-October), Shoot and leaf growth (September-March). Flowering and fruit set (November–December). Veraison, when grapes begin to ripen (January-March). And finally, harvest (March-April). In the Southern Hemisphere, July and on is winter dormancy. So while September to October is our season of harvest in the Northern hemisphere, March to April is the harvest at 20-50 degrees latitude south. As the day’s heat moderates here and cools into evening, I find myself enjoying more reds again. And what better way to look ahead to spring than enjoying reds from south of the equator where spring is ripening now? Malbec is my red of choice at these times. Originally, from northern Burgundy and once a popular blending grape in Bordeaux (it became less so after the 1956 frost killed off 75% of the plantings), it is still popular in Cahors (SW France) where it is known as Auxerrois), Requiring more sun and heat than either Cabernet Sauvignon or Merlot to physiologically ripen. Malbec in northern France was not the best choice commercially. Same cannot be said for Argentina, when cuttings from France were first brought there in the mid-19th century. In fact, ask most people today where Malbec is from and they’ll likely say Argentina. Certainly, it’s the most popular style. Just as Pinot Gris and Pinot Grigio are different wines from the same grape, Malbec from France and Argentina is different though same. In fact, the grapes themselves in Argentina are different than their French relatives, having smaller berries and in tighter and smaller clusters. This suggest that the cuttings brought from France were of a clone that may have gone extinct in France due to frosts or even the phylloxera epidemic. French Malbec, particularly from Cahors will produce at its darkest color and tannic structure due to the high limestone content in the soil. Malbec from Argentina leans toward being plumier (from soil with more alluvial sand) and fruit forward and, generally, with a more silky texture. Grown at high altitude in the foot of the Andes, vines receive sun, but the altitude insures large evening drops in temperature, delaying the ripening process. Grapes have the opportunity to develop ripe fruity characteristics but in balance with acidity - avoiding the soft drink character of otherwise fully sugared but under acidified fruit. 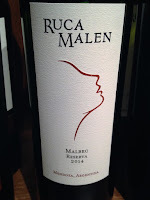 Bodega Ruca Malen. As usual, the Mizer is in the middle of it. Meeting with Pablo Cuneo (winemaker for Bodega Ruca Malen) in August at the “Rural Society of Chicago” restaurant, I and other reviewers tasted several of the estate’s wines, including an estate Ruca Malen Sparkling Brut, but I’m all about reds today (with one exception). 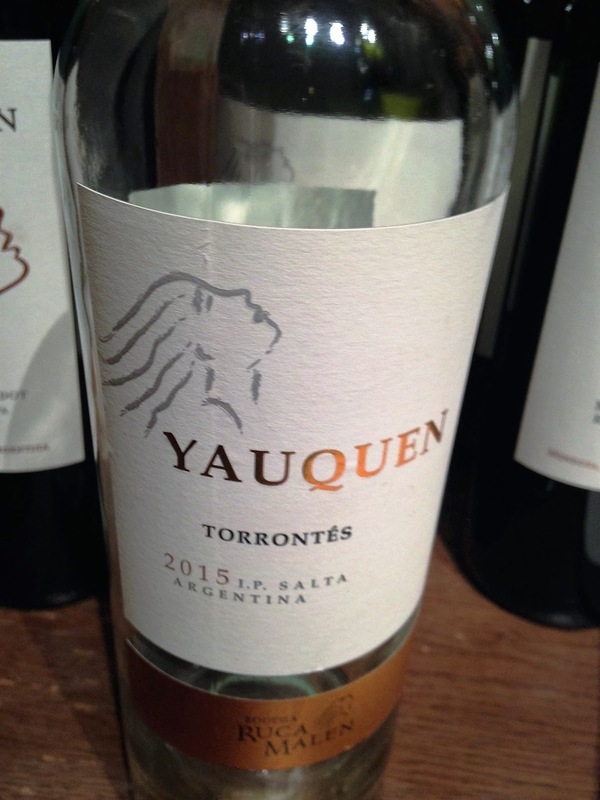 We began with the entry label Yauquen Malbec. Aged six months in 20% French oak (80% stainless) this is a young, fruity and fresh wine meant to be enjoyed every day. Bright clean notes of cherry, plum and violet with a whispered hint of vanilla. 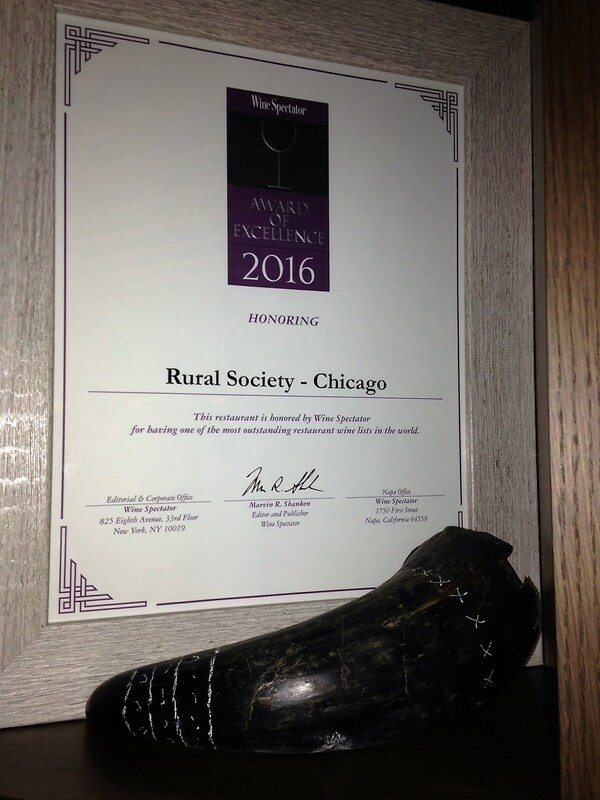 But with an ARP of about $14, I’m happy to invest an additional $4 and appreciate the Ruca Malbec Reserva (2014). Deeper, richer, this wine is everything that made Argentina synonymous with Malbec. Elegant and complex, with a plummy texture, it layers blackberry, plum, black cherry, licorice and notes of violet. This is a soft, but not flabby wine, less tannic than its French relatives, more fruity but balanced elegantly and with enough tannin in the finish to give it structure and ageability of seven years under good conditions. 12 months aging in oak (80% French, 20% American) add some caramel. 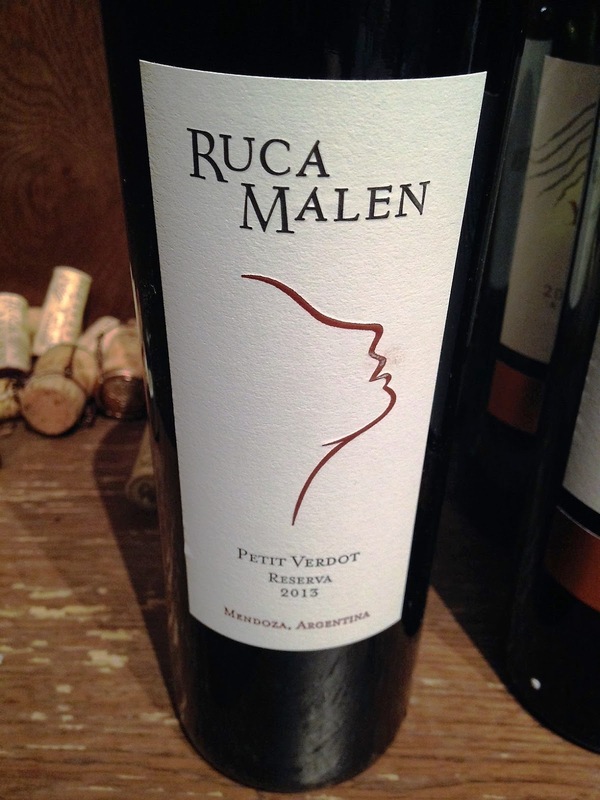 We moved on to Ruca Malen’s 2013 Petit Verdot Reserva. Grown in Agrelo within the Lujan de Cuyo region on rocky soil with deep silt and at altitude of 1000 meters (3281 feet) above sea level, this terroir is regarded as some of the best within all Mendoza. Juice is aged 12 months (80% French, 20% American) with malolactic being conducted in stainless after 28 days of maceration in stainless before going to wood. Petit Verdot, another French grape and another vulnerable to early frost, does beautifully under the Argentinian sun. 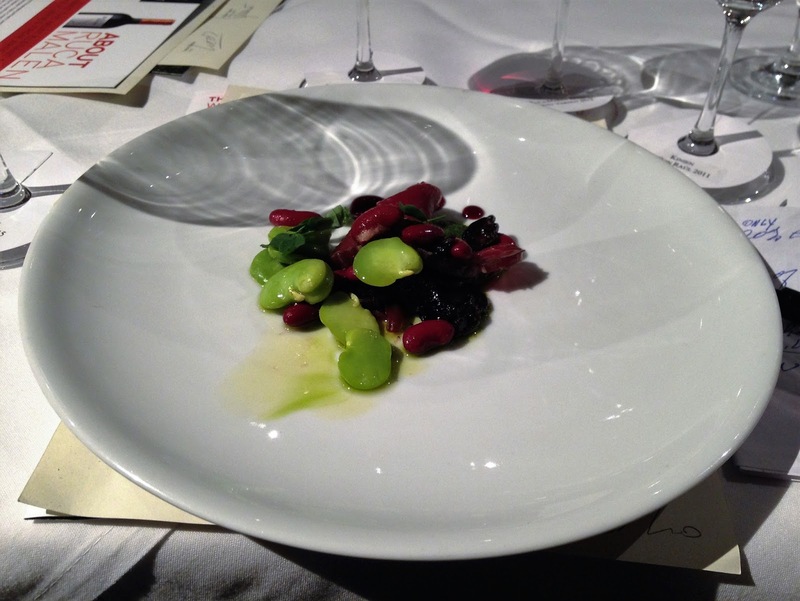 Though traditionally a grape used in blending Bordeaux wine, this stand-alone varietal of Ruca Malen’s struck me as being Bordeaux like despite it being unblended. Iron, clove, allspice in the nose. Deep ruby red with aromas also of red fruit. Blackberry and plum in a rich and deep textured wine with earthy notes and spicy intrigue, this wine, at an ARP of $19, is a super value and begs to be paired with grilled steak, lamb and sausage. 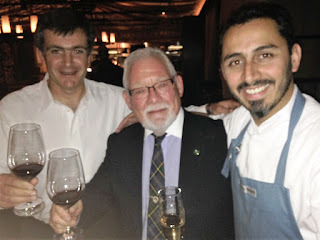 We “finished” with a Ruca Malen 2011 Kinien de Don Raul, the only wine, at $75, anyone could consider being special occasion priced, at least before tasting it. A blend of 64% Malbec, 11% Cabernet Sauvignon, 15% Petit Verdot and 10% Syrah, it spends 18 months in 90% French oak (expensive) and 10% American. An example of the art and craft of master blending, it is made from selected grapes and as a very limited edition. The name “Kinien” is from the Mapuche language meaning “unique” and it truly is. Yes to all the cassis, plum, blackberry, sweet baking spices and notes of vanilla and caramel. Yes to the balance. But one taste of this wine alerts the senses with clove and white pepper that this dry wine which opens so majestically with air in the glass is something different. As I said earlier, this is all about the reds, with one exception. Argentina is renowned for Torrontes and I’ve enjoyed supporting the economy of Argentina by consuming many bottles of this refreshing white wine. 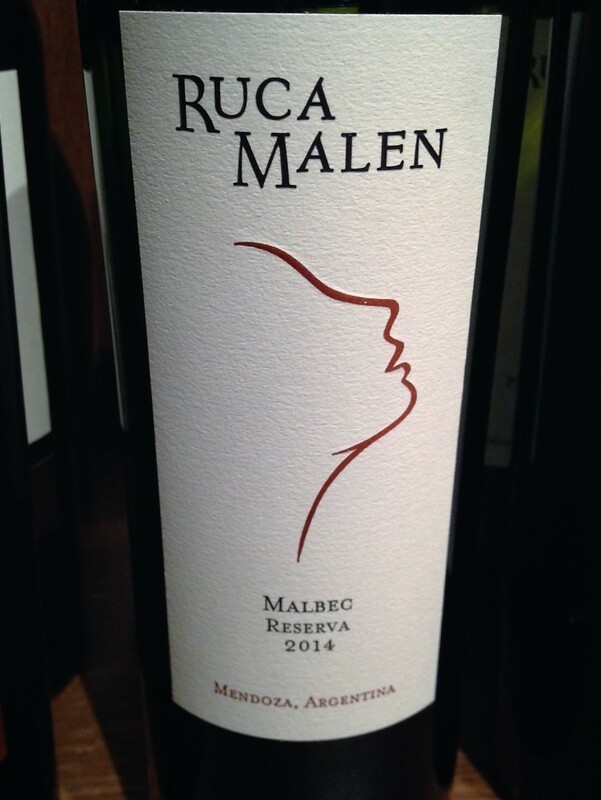 The best wines come from grapes grown at high elevation in the Salta region where Ruca Malen grows vines at an altitude of 1700 meters (5577 feet) above sea level. The origin of this grape is not yet fully understood, but it’s accepted that it originated from a cross of Muscat of Alexandria and Criolla Chica. Pablo referred to the Muscat while tasting, but he didn’t have to. My taste buds knew it already. With more body than most, this Torrontes was so easy drinking, it could be dangerous (14.1 Alc.). Grapes are whole bunch pressed and never see wood. The acidity is refreshing yet without bite. Jasmine, orange blossom and citrus dominate but in wondrous harmony. Fresh, soft and fruity with floral notes, this wine is romance and more graceful than most. At $13, this one is not to be missed. During dinner, Pablo mentioned that his objective in making finished wines was to deliver a clear expression of the fruit with an intensity and sufficient acidity to make Ruca Malen wine that is meant to be enjoyed with food. 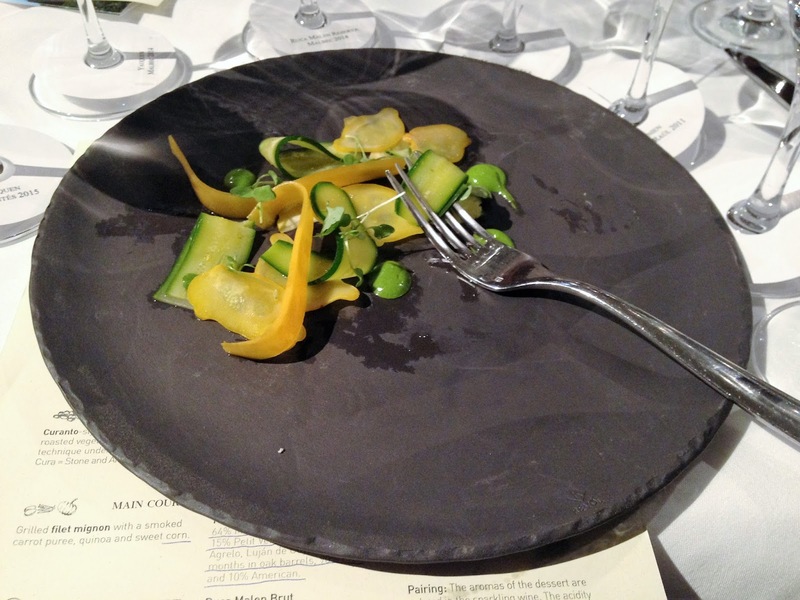 No question: every wine I tasted was food friendly. Tasting them, in fact, just brought to mind meals planned ahead that ccould show off the wines. Still, these wines, and with the Petit Verdot in particular, – rich and plump, yet fresh and with structure – are fulfilling enough to be enjoyed by themselves in the cool of a fall’s evening. 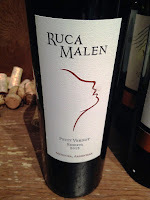 Old world grapes, made by a winemaker whose objective includes respecting the European tradition of making wines meant to be enjoyed with food, but with vines grown in the new world (albeit in unique and excellent terroir), Ruca Malen offers wine at prices that put the words quality to value in bold type. in Argentina and indeed delighted us all. 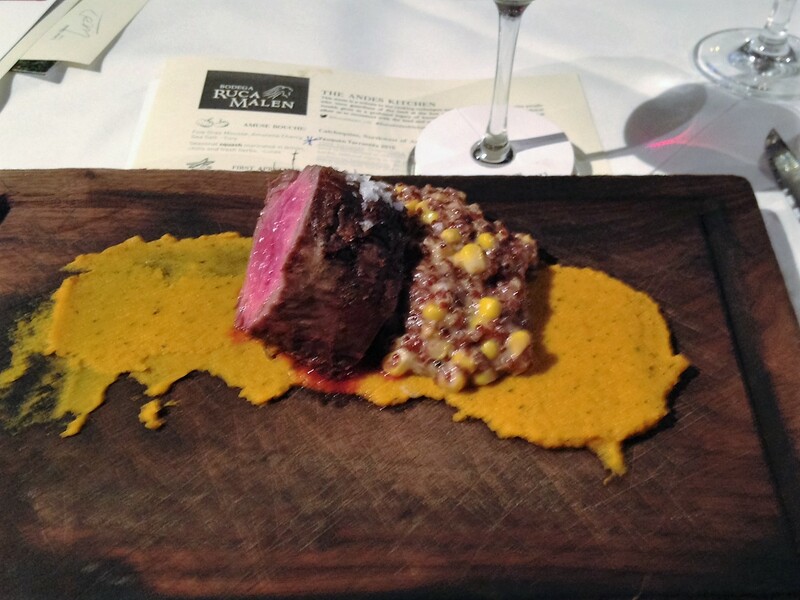 carrot puree, quinoa and sweet corn. herbs. 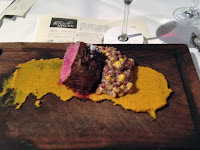 Paired with Yauqun Torrontes.